In The Sharing Economy, entrepreneurs use information technology to create new, better and sometimes unregulated methods of distribution. This typically results in consumers halving the cost and/or getting twice the value on anything from a taxi ride to overnight lodging. But The Sharing Economy is about more than just improving economics. It’s a veritable revolution that is changing everything–how we work, how we drive, what we eat, where we sleep–everything! That’s why I am calling it The Sharing Revolution—the most significant change to our lives since the 19th century when the affordable automobile led to the creation of roads, hotels, restaurants and suburbs. Readers involved in direct selling or network marketing should also read “The Sharing Revolution” article in the October 2014 issue of Networking Times Magazine. My wife and I recently spent three days in Los Angeles without an automobile–despite having to attend 12 different wedding events and business meetings within a 20 mile radius of the LAX airport. We used Uber on our cell phones to connect with drivers who took us where we wanted in luxury vehicles that showed up five minutes after we texted them. Our total Uber 3-day cost was $150–about $11 a ride–far less than the $450 we could have spent paying $60/day for a rental car, $42/day for hotel parking, $40 for gas and $100 or more for parking garages. But the main value of using Uber was not the financial savings. Using Uber was so much easier, better and faster than driving ourselves and hunting for parking, or using traditional taxis and limousines. All this we expected in our new sharing economy where technology is decreasing the cost and raising the value of everything we buy. But what we didn’t expect was to discover a community of Uber providers–all different types of drivers–that received far more value than the $45 to $50 per hour they told us they were earning (net of expenses) driving for Uber. Each driver had a different story of why he was an entrepreneur working with Uber. Here are three of their stories, and then I’ll explain the greater implications for our economy. For readers unfamiliar with Uber, the actual emailed receipts from each ride are attached although I’ve changed the driver’s names to protect their privacy. Driver Joseph took us in a new Lexus SUV from our hotel to a Dim Sum restaurant- click here for a copy of the $8.85 receipt which included 20% gratuity. When we encountered LA traffic, Joseph asked us if he could deviate from the Uber-provided GPS software and take an alternate route. I asked him how he knew LA so well and he told me he lived all his life nearby in Santa Monica–a neighborhood where I knew the homes started at $1 million. I asked him why he was driving for Uber if he didn’t need the money. He told me he was divorced and this was his weekend without his children: Whenever he got lonely he would turn on Uber and drive for a while, meeting new people and explaining his favorite places in his town to visitors. He didn’t see driving for Uber as a job since he could, and would, turn it off at anytime he wanted to do something else. Driver Constantine took us in his Prius from our hotel to our newest Zaniac Learning Center in Beverly Hills– click here for a copy of the $11.22 receipt. Constantine told us this was the first day of his life in Los Angeles. He had arrived last night alone for a mini-vacation–a vacation made much more fun by his taking his “work” (Uber) with him. His not being familiar with LA didn’t affect us since the Uber-supplied GPS and cell phone told him turn-by-turn where to drive. Driver Roger took us in his Chevrolet sedan from our hotel back to the LAX airport– click here for a copy of the $22.22 receipt which also included gratuity. The hotel limo would have charged us $139 without tip for the same ride, and a taxi would have cost about $65. I asked driver Roger to share with us his Uber story on the 25-minute drive to the airport. Roger had discovered at age 50 that he wanted to be an artist, but he needed to earn $200 cash a day to cover his rent and food. So he would get up every morning and drive for Uber from 8:00 am to approximately 12:15 pm–just until he cleared $200 in profit after paying for gas and 20% to Uber–and then he would spend the afternoon painting in his studio. On some days when he awoke early he would start at 6:00am. On these early days, he would get very hungry around 8:00 am, and he liked to eat slowly, so he would then simply turn off his Uber phone and go to a leisurely breakfast until he was ready to return to driving. He was disciplined about working just enough to clear $200 a day before returning to his studio. I could go on and on about how much these and hundreds more providers I’ve encountered in our new sharing economy enjoy their “work.” This past summer my family rented large homes in Jerusalem, Israel in June, and in Coronado, California in July–for much less than the price of a hotel. 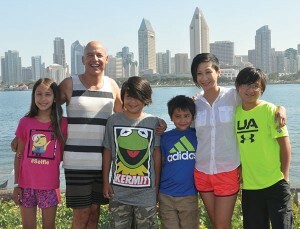 But the real value to us were the sharing homeowners who helped us plan our vacation activities–sharing with us their favorite kosher restaurants and surfing locations. At a recent employee meeting in my ski town, I asked my associates if anyone had tried AirBnB, a virtual hotel company that helps people rent unused rooms in their homes. One young woman, age 25, told me that she rents out the couch in her studio apartment for $70/night, sometimes clearing enough to pay her entire $750/month rent. I asked her if she was concerned about her safety by renting to strangers. She explained that she mostly rented only to recent graduates of Oberlin College–she was a recent graduate herself and would log in on the college website to verify the bona fides of a prospective guest. Like many graduates of the nation’s oldest conservatory, she was a musician and enjoyed jamming or attending concerts with her paying guests. The financial details weren’t awkward for her because AirBnB, like Uber, handles the money exchange for each transaction–holding funds until the provider and the customer verify that everyone is satisfied. The Sharing Economy is mostly about sharing to halve the price on what you want to buy, but The Sharing Revolution is about sharing primarily to double the value of everything you already own. You get both with sharing–effectively a 400% versus just a 200% increase in economic value. Medical Housecalls – Suppose your child wakes up not feeling well and you don’t know whether to keep them home from school. How would you like to be able to get an affordable house call from an approved physician or nurse practitioner with free time who is located only minutes away. Or, if you are a medical professional yourself, how’d you like to make $100-$200 an hour helping out someone in your own neighborhood on your own time. Food Entrepreneur – My partner Rick Lindquist believes the next big thing in The Sharing Economy will be an Uber-like software platform that turns a home into a take-out kitchen. A foodie entrepreneur would create their daily menu including pictures, quantity and availability. Customers and providers would use smartphones and home computers to make the purchase online and watch the provider in real-time drive to the customer’s home for delivery, or watch the customer drive to the foodie entrepreneurs house for pickup. Plumber – Suppose you need a plumber in 15 minutes or less to fix a leak? How’d you like to get an approved plumber agree to meet you in 10 minutes while you watch him drive over to your house on an Uber-like app on your cell phone. This recently happened to me when I called for a plumber at 9:00 pm Sunday evening and we watched him drive to our house on my smartphone. Math Tutor – Suppose your child, and you, can’t understand his math homework, and it’s the night before a final exam? How would you like to get an “approved” local math tutor show up at your door in 10 minutes or less. Restaurant Table – Suppose you want a restaurant willing to sell you a vacant table for 50% off–but only if you guarantee that you will arrive in 10 minutes and that you will spend at least $15 a person. How would you like to see all the seats available nearby. If you’re a restaurant owner, wouldn’t it be nice to only give this discount to approved regular customers, one at a time, until you fill up the tables you can’t sell at full price. Note that a key word in many sharing success stories is “approved”– approved and rated by both the service provider and by the customer. Uber, AirBnB, and hundreds more sharing success stories are not just companies with a good idea, they are companies with great execution of their ideas, complete transparency, and great customer service. The original core competency of providers like Uber wasn’t their technology, it was their knowledge of what the end-use customer wanted—knowledge they often had because they started out as a traditional provider before joining The Sharing Revolution. Uber started out as a traditional black car limo or town car company that owned their vehicles and hired only drivers with a commercial driving license. Uber developed their proprietary GPS-based, transparent-on-both-sides software as a better way to serve high-end limo customers who were often worried they’d miss their flight. But then Uber realized the bigger opportunity was to license their software to their competition, and expand the list of potential competitors all the way down to an individual driver with an ordinary vehicle. Today Uber calls their traditional regulated town car business with licensed, uniformed chauffeurs “Uber Black,” and their non-regulated business “Uber X. Both Uber X and Uber Black use drivers whose backgrounds have been extensively checked, and automatically suspend drivers whose consumer ratings average less than 4.5 on a 5.0 point scale. Uber, by being in both the regulated (black car) and unregulated (software) business at the same time, is able to serve all types of customers in different regulated markets–as well as hedge their bets in locations where the traditional taxi providers are able to manipulate city governments or regulatory officials to curtail one side of their business. I’m facing a possible regulatory challenge in one of the companies I started to improve employer-provided health benefits. Similar to Uber Black and Uber X, we’ve developed regulated and unregulated (software) solutions for each of our customers to choose for themselves. Click here for how millions of U.S. employees are switching to permanent, portable individual policies on a regulated or unregulated basis. 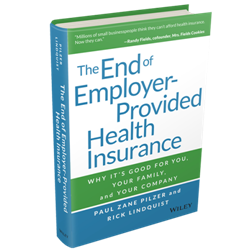 As explained in “The End of Employer-Provided Health Insurance” by Paul Zane Pilzer and Rick Lindquist (Wiley Press, 2014), individual health insurance coverage purchased on a state Exchange is now much better, and much cheaper, than coverage from employer-provided group health plans. But some employers, and their group health insurance brokers, don’t want you to know this for several reasons. Employers need healthy employees in their group plan to pay for unhealthy employees, and employers with more than 50 employees pay a $2,000 fine for each employee that purchases their own individual health insurance on an Exchange (Health Insurance Marketplace). In 2006, I started Zane Benefits, Inc. to provide permanent individual health insurance policies to employees paid for tax-free by their employer. After the company was featured on the front page of The Wall St. Journal in 2007, we heard from thousands of employers wanting us to provide individual health insurance policies to their employees. But our solution wasn’t for everyone because, back then, in 45 states, individual health insurance wasn’t available to employees with preexisting medical conditions. This changed in 2014 when Obamacare made individual health insurance policies available to all employees regardless of preexisting medical conditions, and at a highly subsidized price that was typically 20% to 60% less than employer-provided group coverage. When Obamacare made our product universal for all U.S. employers and employees, it also made some traditional providers of group health insurance upset at losing their customers. These traditional providers scared some potential customers into thinking that they weren’t allowed to give tax-free contributions to employees to purchase their own individual policies. So, at Zane Benefits, we now offer regulated solutions that comply with Obamacare market reforms, and we offer solutions that are outside of Obamacare where employees simply give their employees taxable income, like wages, to help pay for individual health insurance policies. Currently the taxi industry is fighting a losing battle with Uber, the hotel industry is fighting a losing battle with AirBnB, and the group health insurance industry is fighting a losing battle with Zane Benefits. These are losing battles because ultimately the consumer will prevail. Consumers want better ground transportation, consumers want better lodging, and consumers want better health insurance—and thousands more goods and services that can be greatly improved by the technology underlying The Sharing Economy.